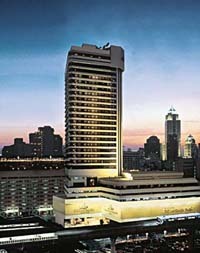 The Landmark Bangkok offers a special blend of Thai hospitality and first-class facilities in one of Asia's most exciting cities. Conveniently located on the famous Sukhumvit Road, one of the city's main arteries, the hotel is within easy reach of the commercial district and tourist attractions. Recently renovated, the hotel has an amazing array of dining options, excellent fitness facilities and exclusive Landmark Club Executive Floors ? ideal for a luxurious business trip. Excitement, atmosphere, service and hospitality ? these are The Landmark Bangkok's trademarks for a memorable stay. This is your perfect address in the heart of Thailand's vibrant capital. The hotel is ideally located along Sukhumvit Road, within easy reach of the business district, major tourist spots, embassy row and the Skytrain system. It also enjoys immediate access to the airport expressway, Queen Sirikit National Convention Centre, BITEC (Bangkok International Trade and Exhibition Centre) and IMPACT convention centre. Bangkok International Airport is 25 km away (30 min). This impressive hotel offers 31 storeys of elegant and spacious accommodation with 359 rooms and 55 suites, all with digital safe, voicemail, direct high-speed internet access and web-TV. 4 Landmark Club Executive floors offer an exclusive Club Lounge with butler service. A fully equipped 2,500 m2 Fitness First Health Club offers a gymnasium, sauna, squash court and group exercise room, as well as contemporary spa with 9 treatment rooms including a beauty salon and a beautiful outdoor pool.